This article is the third in a series that originally appeared in AN's July/August 2018 issue which focuses exclusively on Texas and was guest edited by AGENCY. The rest of the essays will be released in the coming days and examine architecture and practice across the southern border of the United States. In discussions of the U.S.-Mexico border region, what often gets lost is a full exploration of the geographic and social networks produced by the lives that span it. Taking in the meaning of the U.S.-Mexico boundary, the largest migration corridor in the world, requires an understanding of both ends of the journey as well as what lies in between. One way to do this is to follow the money—in this case, migrant dollars earned in various locations throughout the U.S. that are channeled back to households in Mexico. The economic term for this capital flow is remittances, typically used by political scientists, demographers, and NGOs that investigate how and if remittances alleviate poverty in receiving regions. I follow this capital flow to its material conclusions as manifested in migrant hometowns. The “remittance house,” a term I use to describe houses built in Mexico by workers performing unskilled or semiskilled wage labor (or migrants “from below”) in the U.S., reveals Mexican pueblos as distant hinterlands of American cities and as critical nodes in our understanding of the U.S.-Mexico borderlands at large. I first became interested in the remittance house through the stories of my co-workers, Mexican male migrants who lived and worked in Berkeley, California, while investing a portion of their earnings into new homes in Guanajuato, Mexico. The Central Bajío state of Guanajuato and its neighboring state of Jalisco have historically high rates of both emigration and remitting. Economist Paul S. Taylor documented migrants using dollars to build or remodel homes in Jalisco as early as the 1930s. Jalisco is an epicenter of remittance construction that includes homes as well as communally funded public projects like rodeo arenas and cultural centers. Today, Mexico ranks as the world’s fourth-largest remittance economy after China, India, and the Philippines, receiving approximately $20 billion dollars annually, and new construction financed by remittance dollars is evident across Mexico’s 32 states. Formally and materially, the remittance house has become a source of curiosity both for people who live in Mexican towns as well as for those peering in from afar. This has to do with the houses' heavily articulated facades that present a dizzying array of representational strategies. Fluted columns, zigzagging concrete cornices, and repetitive pediment-shaped window frames grace facades topped with false fronts that represent gable roofs or brick battlements. These eclectic arrangements clash with the built fabric of small towns composed of adobe or fired brick buildings with teja tiled roofs—towns once marked by uniformity and homogeneity. In the remittance house, architectural style carries great symbolic weight, as design ideas are pulled from various corners of migrant experiences and journeys. Homes with recessed yards, metal fences, carports, and picture windows are referred to as “estilo Californiano,” or “California style.” Yet they are hybrid forms, where the image of wooden stick-frame construction is translated into local masonry traditions, supported by migrants’ desire to have homes “built to last.” New migrant homes have created a maelstrom of commentary throughout small towns. 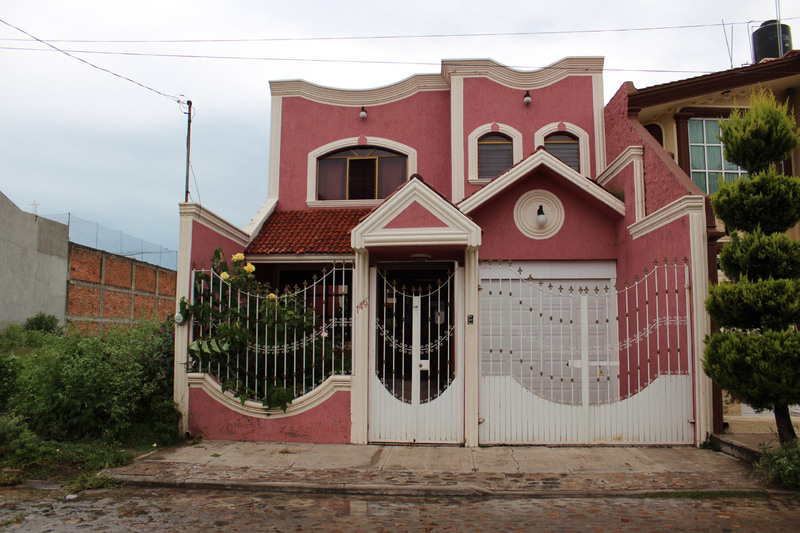 A local architect in Jalisco described the migrant building style as “garigoleado,” or excessively adorned, pointing out a lack of rhythm, proportion, and pattern in the use of generic classical ornamentation, while some neighbors described migrant homes as distinctly modern. Whatever their stylistic attribute, the homes, as defined by artist Walterio Iraheta, are autorretratos—or self-portraits—of their makers. They are a material transformation of the built environment directly linked to the interior world of the self. But the remittance house is not primarily an opportunity for migrants’ personal expressions; it is the material manifestation of the specific political and social conditions under which contemporary social mobility and immobility for migrants takes place. Structural inequality, an absence of access to legal documentation in the U.S., and diminishing opportunities for economic and social mobility in the U.S. and Mexico have produced the spaces in which the remittance house becomes a viable, albeit imperfect, option. To understand these newly constructed homes as imperfect is to ask about the costs and consequences of binational building from below, building a dream home in one place while living and working in another. In order to remit, nuclear families are often separated or fragmented across geographies. For example, mothers and daughters live in a remittance house in Mexico, while fathers and sons work in and send money from the U.S. Meanwhile, elderly parents live in a home built with dollars on a street mostly abandoned or empty due to what neighbors refer to as “the floating population” abroad. Families split by gender or generation incur social and psychological costs as bodies are replaced by dollars, and living at a distance from one’s immediate family is normalized. The project of building a remittance house—of attempting to secure and invest in a future for one’s family—is also susceptible to the complexities of living life as a migrant in the U.S. Both documented and undocumented migrants might lose their jobs, build new relationships in the U.S. while attempting to maintain marriages or relationships in Mexico, become responsible for their ill parents in Mexico, or become ill themselves. Undocumented migrants are especially vulnerable as they live under the terror of apprehension, incarceration, and deportation, and are generally unable to return home without incurring great risk. For any number of reasons, homes may be incomplete or abandoned altogether. Ultimately, the remittance house teaches non-migrants important lessons. They are evidence of migrants’ strengths, the discipline required to achieve personal goals. They are evidence of complex social patterns and costs for families fragmented by global capital, and for whom remitting has become a way of life. Scaling up, they are also evidence of the Mexican and U.S. governments’ unwillingness to enact binational protections and opportunities for a flexible and exploited labor force that the U.S. economy has depended on for over 100 years. Understanding the remittance house in its messy complexity can cultivate the public’s awareness of the extended and complicated spaces that “migrants” are enmeshed in and co-constituting. If Mexican migrants in the U.S. were collectively supported, the term “remittance house” would become obsolete. With the capacity to choose where to live and work, and with the ability to travel, those who built homes in Mexico would join the millions of elite Americans and Mexicans who have second homes or vacation homes. For now, the remittance house captivates, and its meaning reverberates within Mexico and across the Rio Grande. As recent news shed light on the thousands of families who have been separated at the U.S.-Mexico border in the last month, and as political pressure on the Trump administration to end the practice continues to mount, The Architecture Lobby (T-A-L) and Architects / Designers / Planners for Social Responsibility (ADPSR) issued a statement that rejects the role of architects in designing such detention facilities. In their statement, both groups unanimously call for the federal government to end the militarization of the border and for architects to refuse to take on work that would further human suffering. “The Architecture Lobby and ADPSR call on architects, designers, planners and allied professionals to refuse to participate in the design of any immigration enforcement infrastructure, including but not limited to walls, checkpoints, Immigration and Customs Enforcement (ICE) offices, detention facilities, processing centers, or juvenile holding centers. We encourage owners, partners and employees who find themselves in practices that engage in this work to organize, and deny their labor to these projects. “For too long, architects have been complicit in human caging by designing and building these structures. Architects designed the facilities where children call out for their parents at night. Architects also designed the extensive network of facilities where their parents shiver in frigid holding cells. History has taught us that what is strictly legal is not always what is just. It is time for this to end. We call on professionals to join us in this pledge: We will not design cages for people.” T-A-L and ADPSR directly called upon the national AIA to “to prove its commitment to making more diverse, equitable, inclusive, resilient, and healthy places for all people.” As the 2018 AIA Conference on Architecture kicks off today under the “Blueprint for Better Cities” banner, architects from all over the country will be gathering to discuss how to improve cities for their inhabitants. With Walmarts being repurposed as child detention facilities and as the Trump administration floats the idea of building more “tent cities” to house migrants, architects will likely continue to be contracted to design these facilities. In their statement, T-A-L and ADPSR have asked that the AIA directly comment on the practice, and publicly condemn, or excommunicate, its members who would willingly work to design them. For its part, the AIA has issued past statements against immigration and visa restrictions and their impact on the profession, but nothing about the actual practice of taking on such work. AN will update this story with any potential responses from the AIA. 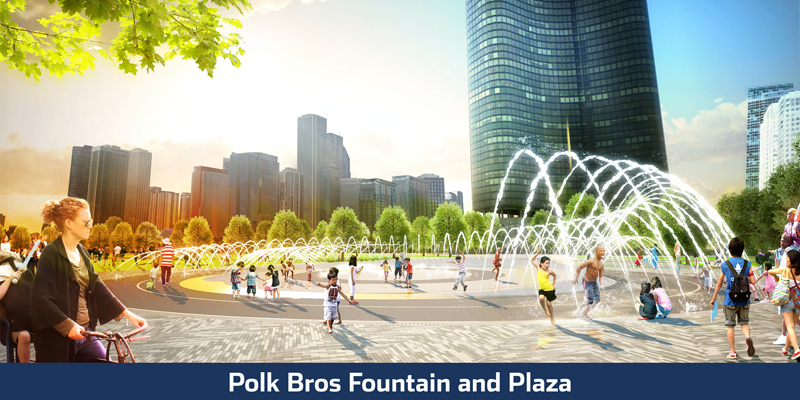 On the grassroots level, at the time of writing, a document has been making the rounds on Twitter that lists the architects and contractors who have been identified as working on such facilities, with contact information for many. On Tuesday, U.S. Customs and Border Protection (CBP) tweeted images of the border wall prototypes in California that showed a wall ideation well underway. CBP unveiled plans for the prototyping phase back in September. The new images, taken near the San Diego–Tijuana border, show construction cranes lifting 30-foot-tall concrete slabs. The panels are one of eight wall prototypes that are set to be built and tested. Though all will be between 18 and 30 feet high, four of the walls will be concrete and the rest will be built with other materials. The work reflects President Trump's campaign promise to build a wall on the boundary between the U.S and Mexico to, in CBP's word's, "deter illegal crossings." "We are committed to securing our borders, and that includes constructing border walls. Our multi-pronged strategy to ensure the safety and security of the American people includes barriers, infrastructure, technology and people," said Ronald Vitiello, CBP acting deputy commissioner, in a September press release that announced prototype construction. “Moving forward with the prototypes enables us to continue to incorporate all the tools necessary to secure our border." Last month it was revealed that three of the six firms selected to build the prototypes had previously defrauded the government. Despite the project's contentiousness, the San Diego Union-Tribune reported no protests yesterday. 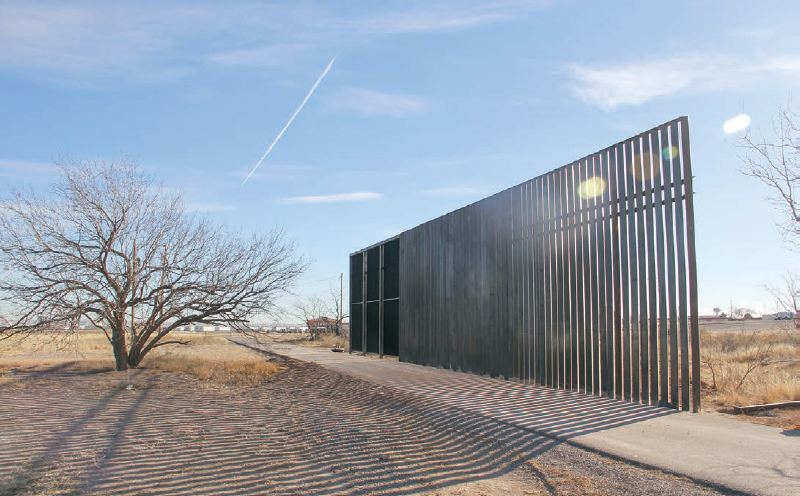 The Architect's Newspaper (AN) is committed to regular, rigorous coverage of the border wall and the controversy that surrounds it. 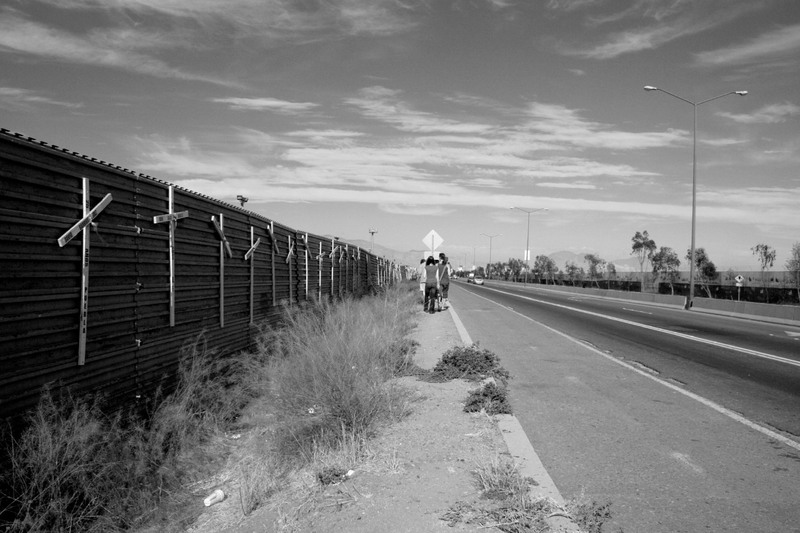 To that end, AN has partnered with El Paso, Texas–based AGENCY to bring readers Border Dispatches, "an on-the-ground perspective from the United States-Mexico border." Each month, the series explores a critical site or person shaping the mutable binational territory between the two neighboring countries. For more news, opinion, and information on the border wall, visit archpaper.com/tag/border-wall. This is the first in a series of reports from El Paso, Texas–based AGENCY, entitled Border Dispatches, an on-the-ground perspective from the United States-Mexico border. Each month, we will explore another “sleeper agent,” a critical site or actor reshaping the diffuse, overlapping binational territory we know as the borderlands. Over the last decade, our changing national security priorities have contorted federal law-enforcement training sites to respond to new and sometimes contradictory demands. In Artesia, New Mexico, several replicas simulating different areas of the International Border Fence (IBF) are built on the site of the Border Patrol Academy (BPA). The “mock fences” are a minor but instructive example of the material residue created by our nation’s ongoing obsession with the promotion and maintenance of a physical international boundary, a hard line separating the U.S. from Mexico. A close reading of the fences, and the training installation of which they are a part, reveals volumes about the shifting whims of the securocratic territory they both describe and inhabit. The BPA is on the site of the Artesia Federal Law Enforcement Training Center (FLETC), one of four national training centers that serve 95 federal partner organizations as well as thousands of other local and international security forces. The site has specialized in providing unique training environments not available elsewhere, including drug and fingerprint labs, and all-terrain vehicle courses. After the 9/11 terror attacks, the site began hoarding grounded jetliners to train air marshals in counterterrorism operations. The site was a good fit for U.S. Customs and Border Protection (CBP), capable of supporting both its “priority mission” (counterterrorism) and “primary mission” (preventing illegal entry to the U.S.). The real physical environment of Artesia, and the otherwise-remote site’s particular coincidence with the logistical networks of the CBP, was recast as an invaluable training asset. In 2004, The FLETC Artesia site was selected as the location for a newly reconsolidated BPA, due to its strategic location near a focus of CBP activity—near hot spots for the eventual assignment of academy graduates—as well as the region’s signature climate and terrain. Artesia lies just four hours from the Southwest border. While seemingly distant from border operations, it is strategically close enough. Many of the geological and ecological features of the site are shared with a large percentage of the territory agents are charged to protect. It is here that the agents rehearse known threats and prepare for new ones, the simulations scripting a generation of borderland encounters to come. Upon arrival, trainees are issued a fake sidearm, to become accustomed to the relentless presence, bulk, and weight of the weapon. Classes are led by retired USBP agents, and use a technique called scenario-based training (SBT). Training takes place mostly in situ, informed by the simulated physical constructs throughout the site and the desert terrain itself. Simulated checkpoints, barns, and inspection areas for railcars and vehicles are scattered throughout the center to host scripted encounters. In addition to physical training, the center uses Spanish-speaking role players, playing a range of border-crosser types, from harmless asylum-seekers to armed smugglers. Classes are taught in high-risk Spanish terminology. According to FLETC documents, in 2013 $1.2 million was dedicated to “add realistic fencing and check stations to enhance border patrol training venues” at Artesia. Since 2014, training exercises have included engagements with a “towering, steel” mock IBF that “realistically simulates the field environment.” Six different mock-IBF sites were planned that year, mimicking the various construction materials deployed in the constructed border throughout its length. Each mock fence was to measure 90 feet long, “and will vary in height from 19 feet to 10 feet,” according to the documents. “The materials will mirror what is used on the international border, to include bollard fencing, as well as fencing constructed from landing mat materials.” The staged constructions create backdrops for scenarios culled from the experience of actual agents in the field, including “when assailants are throwing rocks or other projectiles, or subjects are using vehicles as a weapon against the agents near the IBF.” Only four such mock IBFs are advertised as available for training on the FLETC website currently. In recent years the Artesia FLETC has further blurred the boundary between real and imagined operations when its collection of novice trainees and academic exercises would play host to the endgame of the agency’s ultimate objective—migrant detention. While it appears a simulated detention facility was completed in 2010 for training purposes, a real-world detention center would soon emerge on-site. The training venue proved an expedient solution for federal law enforcement in 2014 when an influx of Central American migrants filled other nearby detention sites. A temporary detention center, holding as many as 672 detainees at one time, was built, conflating the space of border-patrol simulation with the reality of its impact. Ten acres of the site, including existing dorms and classrooms, were converted to serve as medical centers and processing centers, among other uses. Attorneys visiting the site noted the strange proximity of the training simulacra around the detainees’ temporary home. News reports show cribs for child detainees lining the interior hallways of the FLETC trainee barracks. 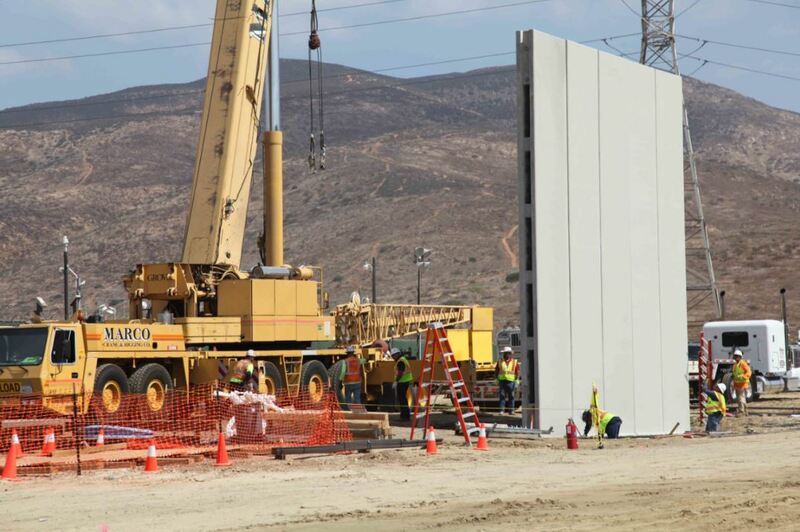 The current administration’s charge of building a border wall requires built mock-ups of the proposed designs in Otay Mesa near the Mexican border. In a way, the practice of sampling potential walls resonates with the sampling of border parts at the BPA, reinforcing a kind of thinking about the boundary as merely a collection of obstructive infrastructural parts devoid of the real-life consequences of blockage and armament. As the duties and performance criteria of the IBF expand to deter and collect more bodies, shifting tactics are indexed and foreshadowed in the space of training. 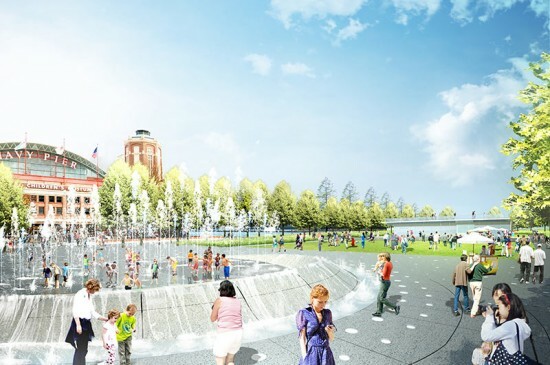 "The thing we have realized is that we actually have districts within this creative corridor geography," said Matt Clayson, director of DC3, a partnership between the College of Creative Studies and Business Leaders for Michigan. "There is a certain density of creative practioners [sic] that we did not have four years ago. That's a good 1,100 creative workers. Four years ago, no." … When Patrick Thompson was looking to open his interior design studio — which is well known for designing the Detroit Institute of Arts' Kresge Court — he was interested in being in Midtown. He didn't realize there was a creative cluster forming, but he liked the activity on the street and wanted to be around other design businesses. So when a first floor retail spot in The Auburn building opened, he moved in last summer. "As a landmark alone, it's been great," he said. "Everyone is starting to know this area. It's a pretty high-profile area, so it's been beneficial for our business being there." The three clusters with the most activity at the moment, writes Amy Haimerl for Crain's, are around Grand Circus Park, near Cass and Canfield Streets, and near DC3 and TechTown Detroit in the city’s New Center neighborhood. Mayor Duggan convened a 17-person panel to chart more innovation clusters around the future and help guide growth in existing creative communities. As must be noted with any story of rebirth in Detroit, the city’s challenges are beyond the ability of any one intervention to overcome. 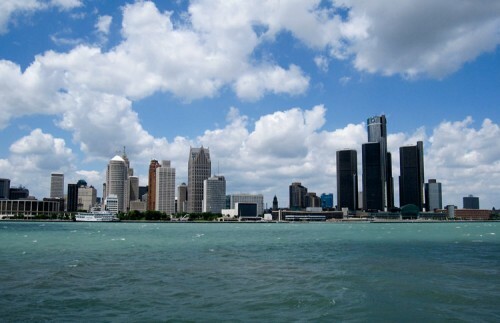 But “innovation districts” are far from the only solution proposed for Detroit’s problems. Immigration reform, perhaps tied to a special city-specific Visa, has been touted as a potential shot in the arm for the struggling city. And transit improvements, especially along Woodward Avenue—which now has national attention—are a long time coming.